Dermarolling / Microneedling / Will dermarolling healthy skin cause damage to it? Dermarolling will not damage healthy skin. The "secret" of dermarolling and many other rejuvenating methods such as certain laser treatments is to cause some very mild damage to the skin. It is a trick to make the body repair the damaged skin. The skin gets rejuvenated as a side effect of this repair. The damage has to be substantial enough to induce repair but not too serious to cause scarring. The holes made by a dermaroller are miniscule. It is a misunderstanding that with 0.25 mm diameter needles, that the holes will also be that wide. The skin closes itself around the pricks immediately. The outermost layer of the skin is not removed by dermarolling (contrary to ablative lasers or deep peels) and there is a lot of intact skin between the microholes made by a dermaroller. This promotes very rapid healing. Those methods where temporary skin injuries are caused by heating up the skin tissue are much more prone to potential burns and scarring than dermarolling where the injury is caused mechanically. The body will never restructure the skin "for the worse" unless the damage is so great that the injury will become a scar. When you accidentally prick yourself by a sewing needle, it will heal without a scar. If you cut yourself badly and deeply by a knife, it may become a scar. Larger injuries become scars, smaller ones don't. There is no intermediate stage. Either a scar for larger injuries, or nice new skin for micro-injuries. Dermarolling / Microneedling / Making Vitamin C , should i use glycerin? You should keep it in the fridge. If you have a container that is perfectly airtight and dark and you make a new serum every approximately 10 days, you can keep it outside the fridge but it is not recommended, because there may be some bacterial growth in standing water after so many days, even though vit. C is a preservative. And there is some long-term degradation of the vit. C due to oxidation, which is less at lower temps. Dermarolling / Microneedling / white stretch marks vs. red/purple stretch marks with dermarolling/needling? The redness of red stretch marks is usually caused by erythema – dilation of blood vessels in the stretch mark. You can check this by strongly pressing a finger into the stretch mark. When you release your finger, the stretch mark is whitish for a short while until the blood returns. When stretch marks mature, they become white with an atrophied epidermis and dermis, tangled elastic fibers and damaged collagen. Needling or rolling red stretch marks will temporarily make them even more red due to inflammation. If you needle densely and deeply, the redness may last more than two weeks but it will always subside. In individuals with darker skin, stretch marks are sometimes brown due to a higher concentration of Melanin in them (Melanin is the skin pigment that gives skin its color). Dermabrasion and acid peels were in some cases successful in making red stretch marks less red and a dermaroller should have a similar effect, eventually. A dermaroller cannot fix the dilation of blood vessels but it speeds up the skin's turnover, which should speed up the processes in the scar. The most important thing is that by making micro-holes into the scar, it will trick the body into fixing the micro-damage and remodeling that area. It is very difficult to say whether you receive better results with red or white marks. Some other methods that attempted to improve stretch marks/scars were more successful with fresh marks/scars than with older ones. Whether this is also the case with dermarolling still has to be established. Just as it is not yet known whether dermarolling could partially prevent the formation of stretch marks. There are studies where Retin A slightly improved red stretch marks (it did not improve white ones). You should try to needle Retin A into individual stretch marks. Do a test patch first. It will sting and it will make the scar temporarily very red. If you are pregnant, do not needle it in. We have customers who reported that dermarolling + needling significantly improved their red and white stretch marks or acne scars and they are very satisfied but we also have customers who did not achieve much, or any improvement. Dermarolling / Microneedling / Which kit is right for me? The skin on the deltoids is also quite thick, no problem using a 2 mm roller. You can regulate the depth of penetration by controlling the force with which you push the roller head down. The skin is thin on the neck, on the top of the collarbones and in the armpits but deltoids are no problem with 2 mm, especially not on male skin. Dermarolling / Microneedling / Dermaroller + TCA 5 weeks apart? Yes. Five weeks is enough for the skin to regenerate. The collagen production will likely continue even after that but the TCA peels will not interfere with that. Medium depth peels - reach the papillary dermis - usually performed once in 6-12 months. Deep peels - reach the reticular dermis - Can be performed once every few years or once in a lifetime. "6. Device according to claim 5, wherein the diameter of the needles (5) outside of the point area (6) is between 0.15 and 0.3 mm." "In the remaining area of the needle, outside of the point area, diameters between 0.15 and 0.3 mm have proven suitable." "Outside of the point area" means the needle shaft. The patent implies that a needle width of 0.31 mm is unsuitable, and microneedling experts say that this is due to scarring. 0.25 is well below that diameter. "In my experience, 0.25mm needle diameter is the maximum that can be used without causing a new scar in the skin. Smaller diameter needle skin rollers can be used but do not maximise the dermal injury and therefore will be slower to produce results." The medical doctors and dermatologists who opined this on that site have no financial stake in the sales of any commercial roller model - they are purchasers, not sellers of dermarollers. 0.3 is just too risky. Lower than 0.25 and there is little effect. 0.25 is the ideal diameter. The rolling speed is not relevant. You should not roll extremely fast though, for if a needle would be bent, you would do less damage if you were to roll slower. Yes, as we write everywhere, in our instuctions, in our articles and here on the forum, six weeks is the absolute maximum when rolling with 2 mm needles. Any more rolling and you can do damage to your skin and you will interfere with proper regeneration. However on thick skin on the back, you can roll once a month with that needle length. I don't understand what you mean by "these needles are thick".. Perhaps you meant long? They are not thick, they are 0.25 mm thick - the perfect thickness for micro-needling, as explained in a recent forum posting. 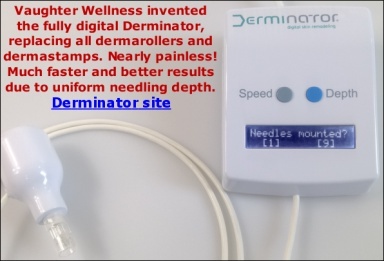 There is a dermaroller vendor aggressively advertising that every other roller's needles are too thick, but in fact it's a marketing gimmick and by having a roller with thinner needles, they hope to capture a significant chunk of the market. Thinner needles than 0.25 mm simply won't have much of an effect. 0.25 is what the plastic surgeons use, and they pay a small fortune for their rollers, being able to use any roller they like. They like 0.25 mm. Dermarolling / Microneedling / Wouldn't dermarolling over the same area multiple times in one session increase the chance of scarring? Dermarolling has been pioneered by a few plastic surgeons over some years. They found that 0.25 mm is the best needle diameter. Smaller, and the effect will be sub-optimal. Larger, and the effect will be sub-optimal too. Plastic surgeons roll with 0.25 mm and they roll with up to 3 mm long needles and much more vigorously and much more often than five times over the same skin. I refer to the picture linked to above - that woman's face is a bloody mess. No scarring - on the contrary: Good results. However, as home-rollers you really can't go to such extremes - it's a risk of infection and nerve damage and the added value is marginal. There is purely theoretically a very small chance that two holes partially overlap because the density of roller head surface to needles-surface is very low. But in reality, that risk does not exist at all, or is infitesimally minute (such as a single overlap per year of rolling) Because you have to understand that the needles do not punch 0.25 mm wide holes in your skin. The skin is like a thin latex sheet. You punch a 0.25 mm hole in it and immediately the hole closes itself completely. Within a tiny fraction of a second. Before you have lifted up the roller from the skin to do another roll. Even if the next cycle has a needle landing 0.25 mm next to a prick, they won't overlap because of the flexibility of the skin - even old skin. Even if this all would not be the case, even if skin would have no flexibility, there still would be no scarring from two overlapping 0.25 mm holes. They simply would fill up with new, flat collagen and elastin, it would tan and the result would be invisible. Don't despair - retinoid dermatitis improves with time. Almond oil and Panthotenic acid will speed up the recovery. Judging from the overdosing symptoms you experienced when you took the vit. A, you can be glad you did not end up with permanent kidney damage. I did not intend to depress you with my "vit. A death" story! I'm sorry for that. Just explaining that contrary what some may think, vit. A indeed does cause deleterious skin effects, when overdosed. Especially when overdosed orally. When a dermaroller is used on vit. A induced skin inflammation, it will make things worse. Retinoid dermatitis can't be improved by dermarolling - on the contrary it exacerbates it. Use the corticoids prescribed to you and hopefully you'll skin will improve quickly. Tea tree oil - applied without rubbing - may help too, as it is an anti-inflammatory. Taking high oral doses of vit. A is dangerous because vit. A accumulates in the body. Excessive intake manifests itself amongst other things by skin dryness/peeling and skin rash. Taking too much vit. A can be fatal. It happened to Scott's polar expedition, who ate too much polar bear liver. But adverse effects of vit. A occur much sooner, and likely even sooner in sensitive individuals. The problem with vit. A is a cumulative toxin and that its elimination takes months. It is an important vitamin for a healthy skin, but when you take too much, it totally destroys the skin. Scott lost the soles of his feet, his nails fell off and finally he turned blind - all due to vitamin A poisoning. Yes, his skin fell off completely. Also the skin of his hands. One day he took off his gloves and he stared at raw meat. The skin of his fingers remained inside the gloves. If any strange skin effects occur and vit. A has been supplemented orally, then vit. A sensitivity should be the first and foremost suspicion. Vitamin A is not going to make your warts disappear either. I had problems with reccurring warts on my feet soles. I solved it by applying one drop of 16% sulfuric acid every day. I applied it with a toothpick. Just to the wart itself, not to the skin around it. After a while it destroyed the wart. I continued for a while with this remedy, to destroy any deep residues. The wart hasn’t reappeared in ten years. You can buy 16% sulfuric acid on Internet but be careful with it.. Yes, it will work very well. Especially if there is hardened collagen. Needling can't, - neither can any current method, even the most expensive - make the scar totally disappear. The cut is throughout all skin layers. Needling can soften the scar and change its appearance to be more naturally skin-tone. Below are three photos of one of our customers that needled her 35 y. old vaccination scar. The first photo is of the scar before needling. The second is just after needling. The third photo is the vaccination scar after 4 needlings (4 weeks apart). The photo is taken 5 weeks after the last needling. The hardened collagen scar tissue is mostly gone and the scar has tanned for the first time ever. She has used the single needle, topical vit. C and Infadolan. It is much less visible now. No other treatment was used. The photos are not manipulated. I remember that a long time ago (more than ten years IIRC) that a company called Essential Organics was forced (by the FDA?) to drastically reduce the amount of vit. A in their "Mega Vites". The reason was that it was proven, also in animal tests, that large doses of vit. A could cause serious birth defects. I think that some people are very susceptible to vitamin A and that vitamin A causes wrong tissue formation somehow in those people. Vitamin A is essential for proper skin formation in all people, only perhaps in around 0.1% of people when they take too much - for them at least- it causes tissue malformation. Just a postulation of course. Everything has a cause and perhaps in some cases this is the cause. We need more data. Self-promotion ahead.. About bent needles: All rollers are made in SE-Asia, and all rollers are relatively cheap to produce. Even the ones with LED lights, which are a useless gimmick, used to justify a ridiculous price. A roller subjected to rigorous quality control should cost not too much more than the worst rollers. The most expensive rollers are always a "scam" in that sense, because you pay through the nose for no reason. The cheapest rollers on eBay and Amazon are the bottom of the barrel, basically brand-less rollers that came from batches that failed QC sampling tests. We are not unscrupulous sales agents for any factory. We regularly buy new types of rollers, test them and sell the ones that we know will give us the least customer support issues, the most sales due to optimal price/quality factor and hence the most positive word-of-mouth. We order our rollers directly from the factories in batches made for us. They start up production for us. Rollers are not automatically produced, they are hand-assembled! So it can take one month before we receive our order of 1000+ dermarollers. And we always make it clear that we expect quality or there will be no next order. This is how we can offer good quality for a good price. You can see that we started to sell a new type of roller. We're phasing out our old types. That's because we found a slightly better one. It is in our best interest to keep researching the market for the best value for money because our business model is all about filling the niche with the best quality for the lowest price for everything we sell. We don't even waste money on advertising. A good product sells itself through word of mouth. We compete on expertise, customer support and price/quality. All dermarollers can theoretically get a needle or two bent when they arrive at your home. Ours too. However, at least with our rollers it's so rare that when a customer says: "My roller arrived with bent needles" we simply refund them without further questions (well, occasionally we may ask for a picture, for quality assurance reasons). The needles should definitely not bend when you place the roller head-down in a glas jar! If you don't chuck it in with great force, it should be no problem. Again about dermarolling companies: I can only speak for ourselves when I say that I am constantly researching micro-needling. I'm preparing an article about Hyaluronic acid at the moment. I am very sure that 99% of the other companies that sell dermarollers are scammers, basically. They are just PR-agencies attached to Chinese factories, or some young "search engine optimizers" interested in "making money online". They always advertise like crazy on Google. We don't need to - we use word of mouth. I haven't seen a single respectable company out there, it's all totally disinterested money-grubbers, promising the moon. If you know an exception, let me know. Even "Dr. Roller" only tries to keep up a respectable appearance to justify their inflated price. We sell the exact same roller for half the price. They are all sales companies, not skin experts or employing anybody even remotely interested in the skin. They have advertizing folks, forum SPAM folks and sales page design folks but skin folks are ominously absent, which becomes noticeable when you ask them a difficult "skin question". When I don't know the answer, I sometimes spend half a day on the net, hunting for a cross-verified, evidence-based answer. John spent hours, some weeks ago, in figuring out how to make rounded corners on our sales page, lol.. We came to the conclusion that having a fancy-looking site is pointless. It's competency and reliability that people are interested in. So we focus our attention mainly on that. It's not easy to compete with companies who's net profit is many times ours, and who invest a large part of that into ads and web design. I'm sorry but I am at a loss what this could be. It was mentioned at the top of this thread that three dermatologists had no idea either. For science's sake it would be very useful to know what you have in common. High levels of a certain orally administered vitamin for example? Especially vit. A, some people are allergic to vit. A. We have sold dermarollers (often more than one) to a few thousand people. This is the first time we hear of this. But you reported that those marks were already present in some form before rolling. So my wild guess is vitamin A allergy. You could try stopping all skin treatment and all oral supplements and see whether the situation improves over the months that follow. Combining saline with subcision is a more "aggressive" approach and it should theoretically give better results but it is impossible to conclusively answer your question. Very few doctors perform this procedure and just as it is with other methods, it is individual - some people achieved very good results and some did not..